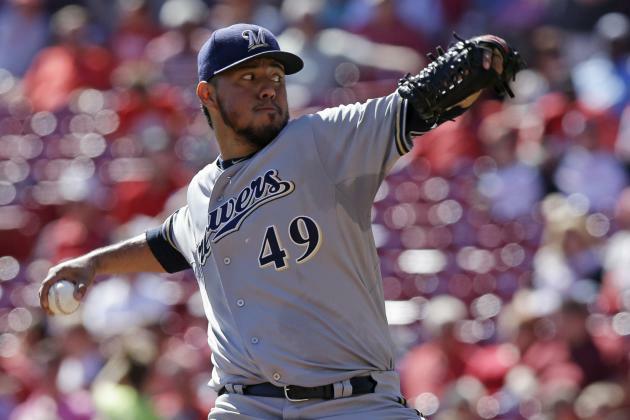 The Texas Rangers acquired pitcher Yovani Gallardo from the Milwaukee Brewers. In exchange the Brewers received a group of young players, infielder Luis Sardinas and right-handed pitchers Corey Knebel and Marcos Diplan. Milwaukee will also contribute $4 million towards Gallardo’s $14 million salary for 2015. Gallardo, who turns 29 in February, will be eligible for free agency next offseason. He’s been very durable, logging the sixth-most innings in baseball over the last six years. That characteristic is surely appealing to the Rangers, who were racked by injuries last season. The right-hander posted a career-best 3.51 ERA in 2014, though his strikeout rate dipped to a career-low 17.9 percent. After posting strikeout rates of at least 23.7 percent from 2009 to 2012, Gallardo’s K-rate has dipped significantly the past two seasons. Steamer doesn’t see Gallardo’s strikeout rate rebounding. It projects a 16.7 percent strikeout rate and a 4.61 ERA. In the hitter-friendly Ballpark at Arlington that would make him a roughly average starter. An interesting thing to note is that Gallardo pitched to two of the best pitch-framing catchers in baseball while with the Brewers. Jonathan Lucroy and Martin Maldonado ranked at the top of the list by framing metrics. Now, he’ll be throwing to Robinson Chirinos and Tomas Telis or perhaps another backstop the Rangers find. His expected strike zone will be markedly smaller in 2015. Perhaps Gallardo will compensate by pitching more aggressively. As he won’t get the same number of calls around the fringes of the zone, he might attack hitters more often. This could reap positive results. The Rangers will get a chance to see how good Gallardo can be without the benefit of two excellent catchers helping him get extra strikes. Presumably they wouldn’t have made this trade if they didn’t believe he could adjust. Meanwhile, Milwaukee obtains a trio of prospects that gives their farm system a much-needed infusion of young talent. The 21 year-old Sardinas struggled in a 2014 season that was split between Double-A and Triple-A. Still, he’s close to the big leagues. There are questions as to whether he can hit enough to be an everyday player. If not, he’ll likely slide into a utility role at the major league level. Knebel, who the Rangers acquired Joakim Soria trade last season, is a pure reliever. He was dominant in the minors, and gets his fastball up to the mid 90s. However, he suffered from a UCL strain. Fortunately it did not require surgery, but he could be at a heightened risk for an arm injury going forward. Marcos Diplan is an 18 year-old prospect who made his debut in Rookie ball in 2014. Gallardo has a history of success, and the Rangers didn’t have to surrender any top prospects in order to acquire him. Time will tell how he fares without the excellent pitch-receivers to serve as his battery mates. On the other hand, the Brewers received two players that are close to contributing at the big league level, albeit without high ceilings. And, they dumped a good chunk of Gallardo’s salary.